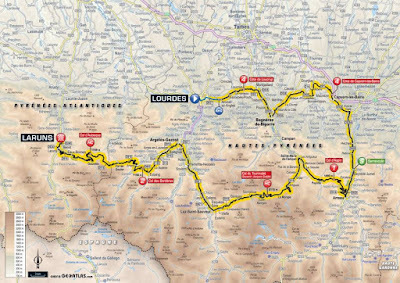 Stage 19 in isolation is probably not the toughest route of the 2018 Tour, with the climbs not being as long as the Madeleine and Croix de Fer in the alps, nor as steep as the climbs in Stage 10. 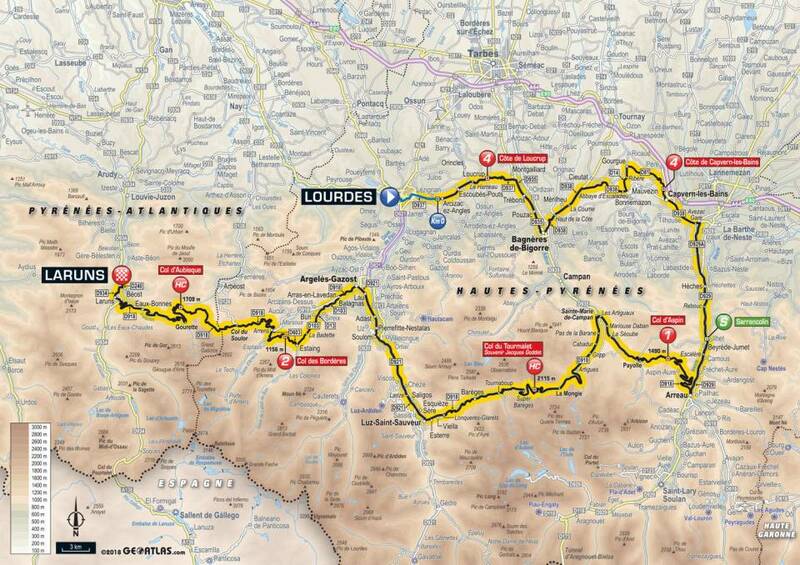 But, coming at the tail end of the tour, in all likelihood it would feel like the hardest. As we become accustomed to, the weather was fine and clear when we rolled out of Lourdes just after 0700. I enjoyed recognising some of the roads I’d ridden twice in 2013 – once while replicating (the first part of a stage), and again between Lourdes and St-Gaudens. 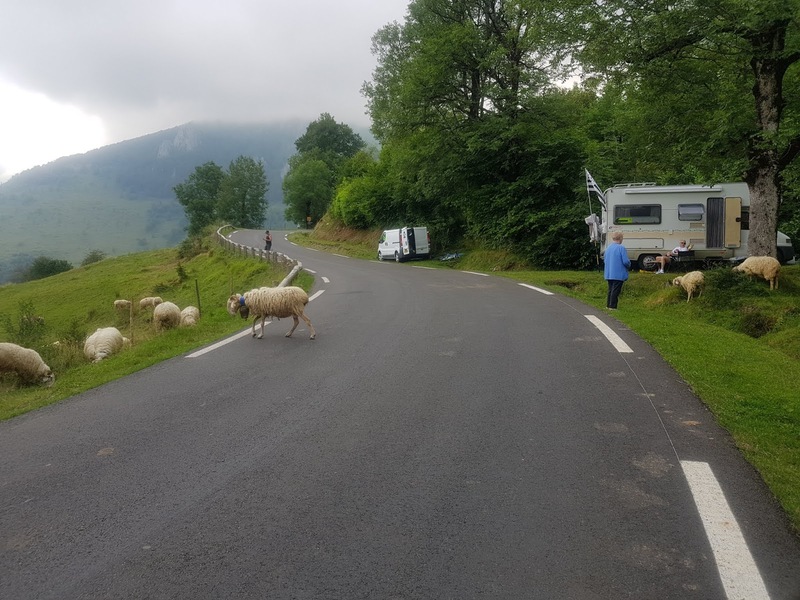 One disadvantage of the early start was that we were away before the flechage guys, but they passed us for good in Bagneres-de-Bigorre. We’ve seen them on the road most days, and they always give us a lovely toot and big smiles – it really feels as though they’re genuinely happy to see us, and certainly the opppsite is true. 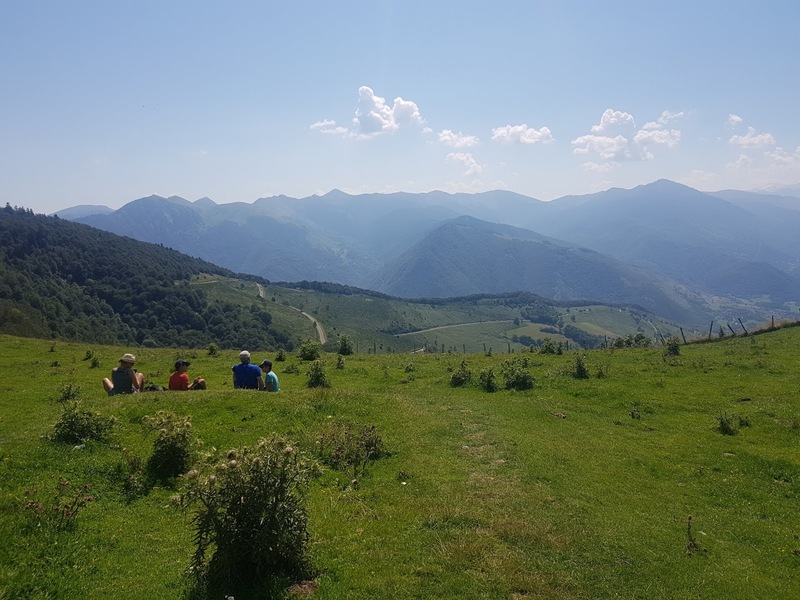 After Capvern, which we approached on a road I hadn’t used, we made the turn up the valley to the base of the Col d’Aspin. I’d been quite introspective, and I could feel my mood dropping as a result. I’d been contrasting the solo experience I’d had in 2013, during which I’d been nearly constantly in awe of my surroundings, and completely relaxed throughout (an occasional bit of accommodation anxiety or laundry rage aside), with this current shared experience, which feels much more like everyday life, complete with its pressures, obligations and frustrations. As my mood dropped, I struggled to hold wheels, and at one point I dropped my chain, and had to stop on the roadside to sort it out. 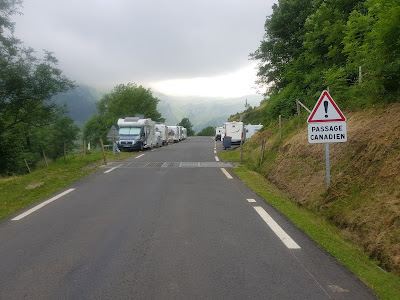 I yoyoed off the back of the group until they pulled into a layby about 3km out from the base of the Aspin. After a wee, I rolled out alone, hoping to pretend for a few minutes that it was just me, my bike and these roads. 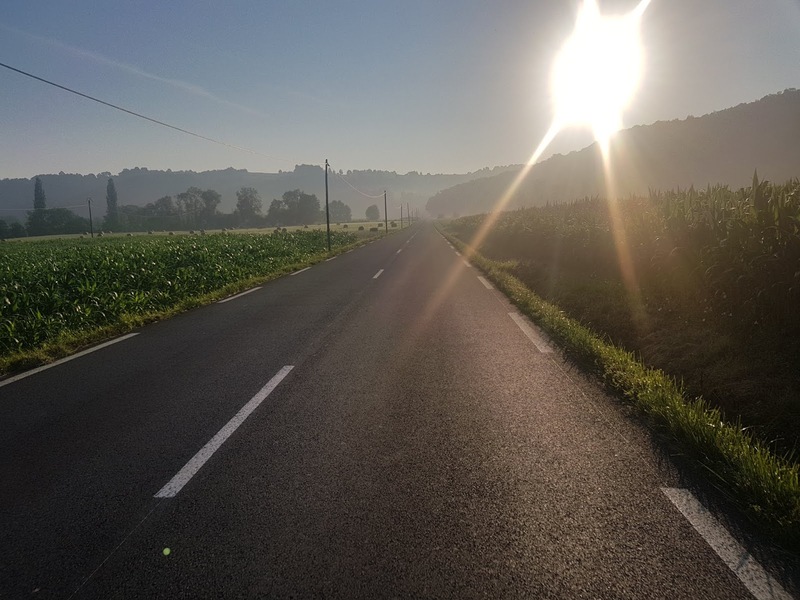 Without willing it so, my pace ratcheted up and up – literally a few minutes earlier I’d felt unable to keep up with my companions, but not my brain had woked up, and in turn, fired up my legs. I could hear someone had come with me, and about 30 seconds from the turn onto the climb, I could hear Jason suggest I slow down. I waved back dismissively, but didn’t say anything. Had I, it might not have been particularly polite. We made the turn onto the climb together, but very soon after, I could tell I was alone. Man, it felt glorious to fly, and to have only myself to worry about. About 4km from the top, my legs started to falter somewhat, but by then it didn’t matter – the mini-rampage had served its purpose, and I could feel that my brain had reset. When I got to the top, I received the biggest smile I’ve yet seen from Roger, who’d become accustomed to Jason being the first to the top of every major climb. He arrived just under 6 minutes later, and the rest of the boys about the same again. 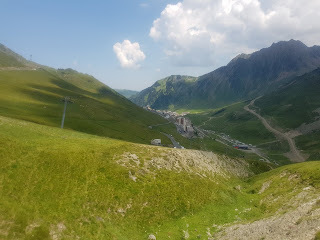 A benefit of the hammer-fest was some time to sit and admire the view, And what a view it was, looking over to Peyragudes, and understanding better the parcours of Stage 17 as a result. 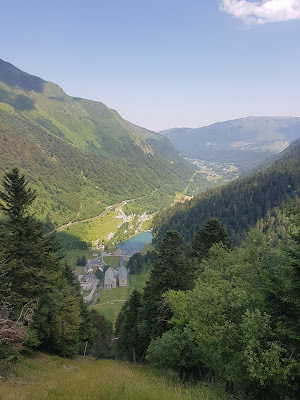 About half way down the descent, my bike started squirming a bit on the corners, and I diagnosed a puncture in my rear wheel. David gave me a hand to replace the tube, and luckily Bill passed in the van so we were able to fill it with the big pump. We probably pushed a little too hard down the valley into Campan, and then made the turn onto the Tourmalet. I’d been unable to ride this back in 2013, and had been delighted to see that it was featuring this year. Even if my legs had been willing (which they most certainly weren’t), I was in no mood to rush this, and spent the climb riding with Aaron, occasionally giving him a bit of a push, to effectively mellow out the gradient. 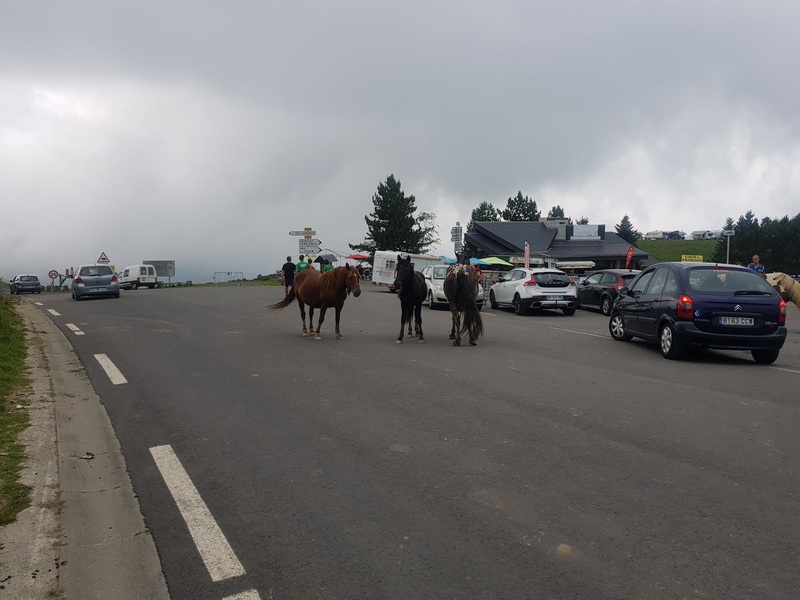 There were lots of people out riding, and in the ski-resort of La Mongie, there was a surprising police presence. As we passed through the ski village, I noticed two of the signage vans and stopped to say hi - interacting with these guys has definitely been a highlight of the tour, and it was unlikely that we'd see them again. The final kilometres were hot, but the views were wonderful, and the summit beckoned. 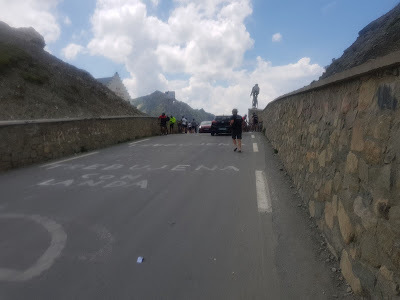 At the top, Jonathan minded my bike while I ducked into the souvenir shop for a fridge magnet, and on the way out I spoke briefly to Frank Schleck, reminding him that we’d met back on Stage 10 (one day ahead)! 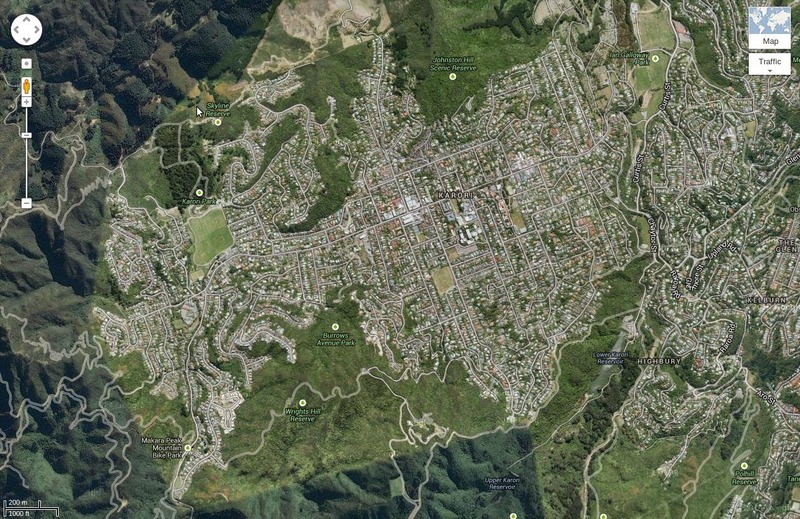 I rode the descent with Mike and David, and what a long one it was! 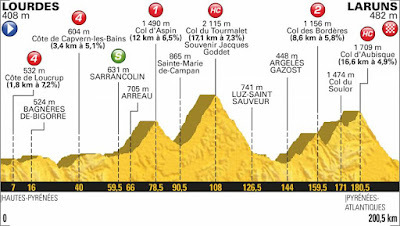 At Argeles, we turned off towards the Col du Soulor. 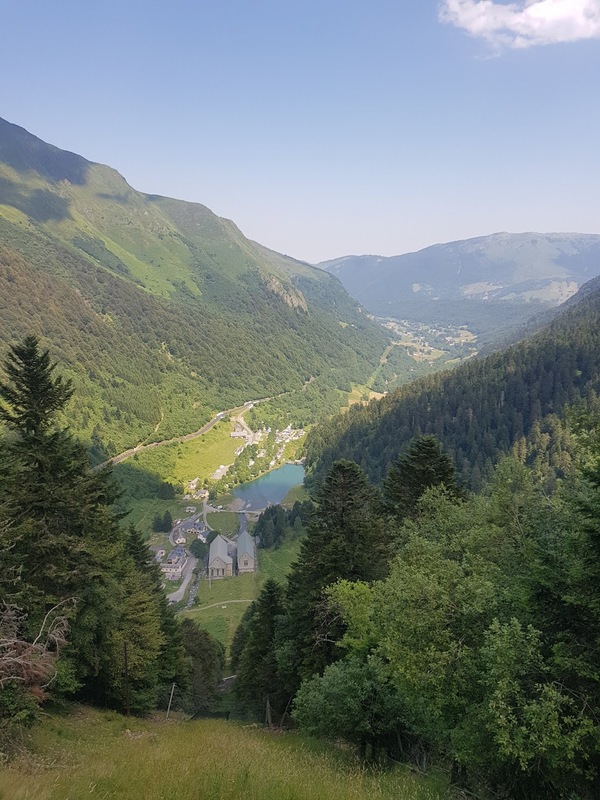 From the profile, it was clear we’d soon deviate from the main route, since there was an extra descent after the Col des Borderes. It had become ridiculously hot (38 degrees, at times), so a village fountain at the turnoff gave an excellent opportunity to cool down a bit. Paul had stopped in Argeles for a reportedly wonderful public toilet experience, but I soon found myself riding alone again. The valley road was lovely, and while the adjacent river looked incredibly refreshing, I resisted the temptation to go for a swim. 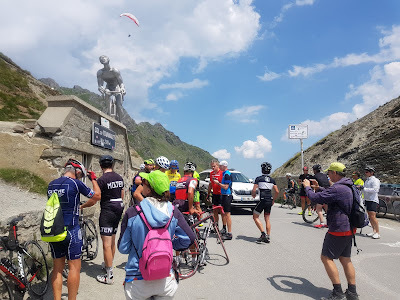 The final kilometres were steeper, and just over the Col, I met Jonathan who advised that Roger was parked in the village below with some food. When I got there, Aaron, Bill and Julie were also there, and they pointed out Stu and Bruce on the road above. 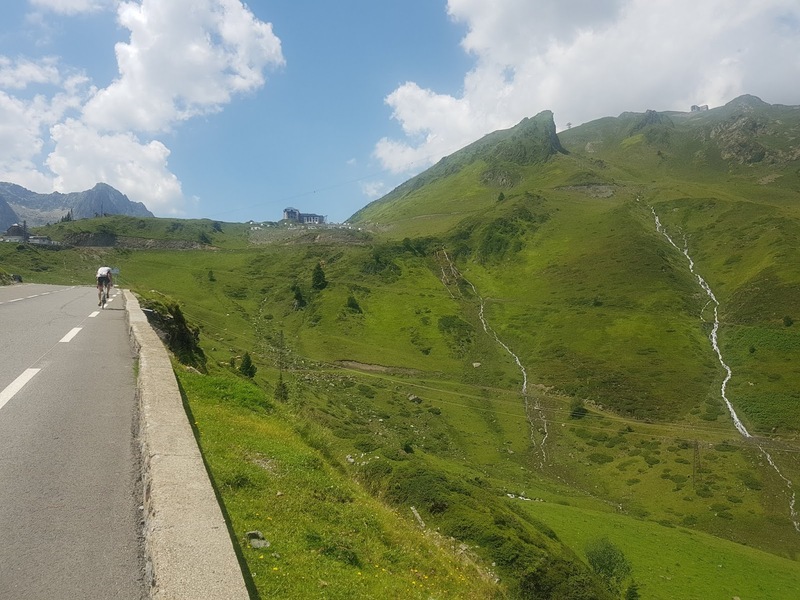 Steven and Jason were in the process of riding back down to the turnoff, having ignored the arrows directing them off the main route (and the subsequent lack of them) – ouch! 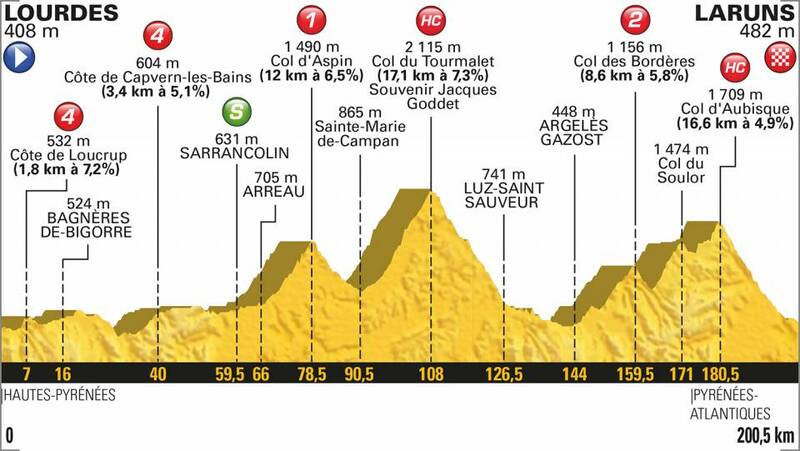 We’d all regarded this stage as the last major hurdle, and as such the climb up to the Col du Soulor was really the last battle, and one I enjoyed immensely. It had been a long day, but one which I’d enjoyed a lot – from my solo smash up the Aspin, to riding with Aaron on the Tourmalet, and now, some nice solo time on the final big climb. The sheep were wearing large collars with bells on, and were making quite the racket! Cattle grate? Poor lack of attribution, apparently! 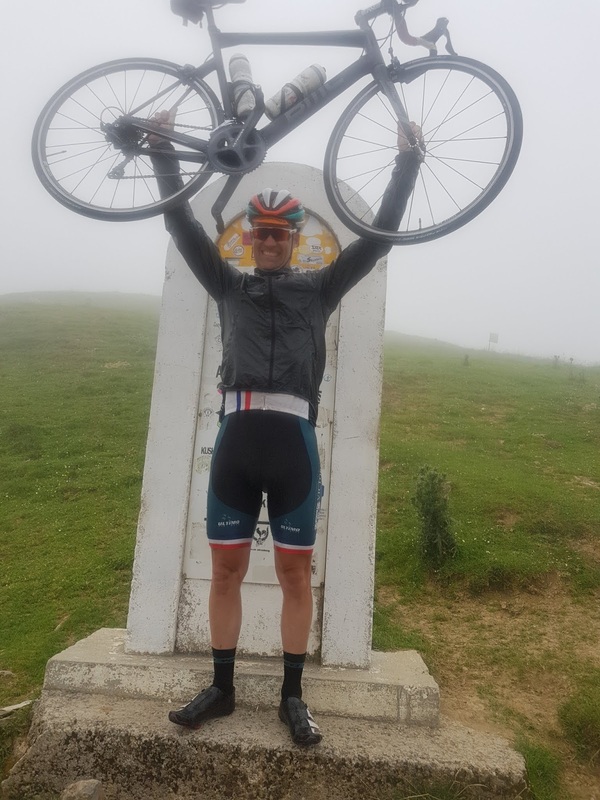 I grabbed my jacket and helmet from Jonny at the top, and then cruised the somewhat incredible road through to the Col d’Aubisque. There, I found Stu and Bruce in an elated state, and a few minutes later we started the 20km descent to the finish together. 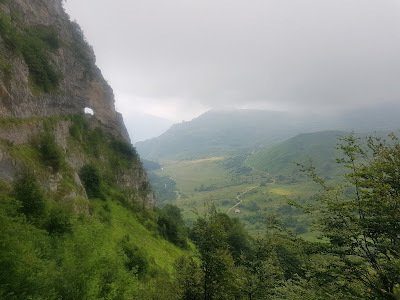 I remembered the sights on this bit of road to be particularly stunning, but a combination of the descending speed, and thick cloud we were in, meant I hardly saw anything!!! Not long after we’d arrived at the finish line, Aaron pulled in, and we embraced – man he’s ridden out of his skin over the last three weeks, and it has been so impressive to watch, and be part of. A multiple Coast to Coast finisher, the last few months are the only time in his life he’s been a dedicated cyclist. Paul and Mike arrived in, and then Steven and Jason, the latter looking particularly shell-shocked after their unfortunate extra distance and climbing. 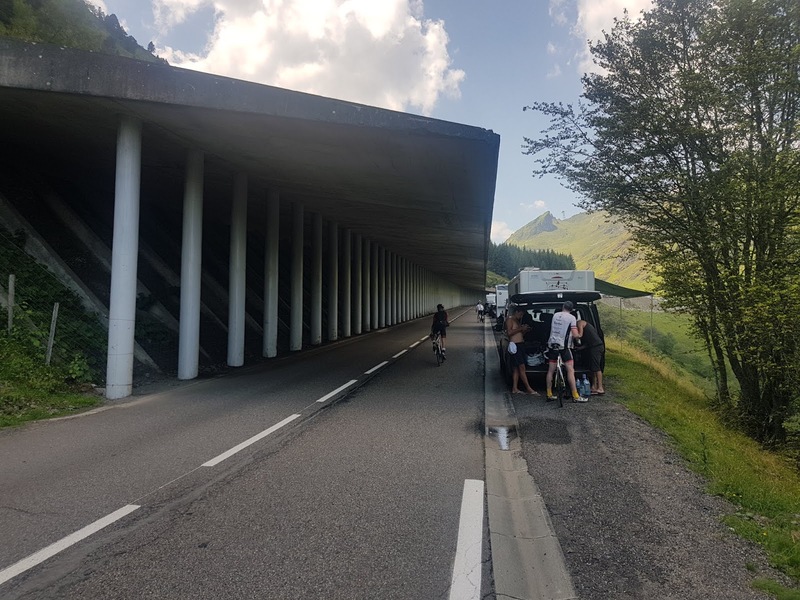 We bundled into the vans to start the 170km transfer to our accommodation a few kilometres from the start of the TT course, glad to have this epic day under our belts. 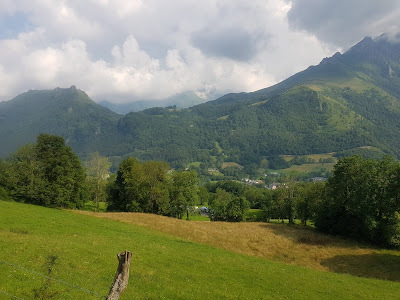 Strava: 206km with a whopping 4800m of climbing, in an elapsed time of just under 12 hours, and even managed a 550th place on the Col d'Aspin segment, out of about 15000 strava-enabled riders! 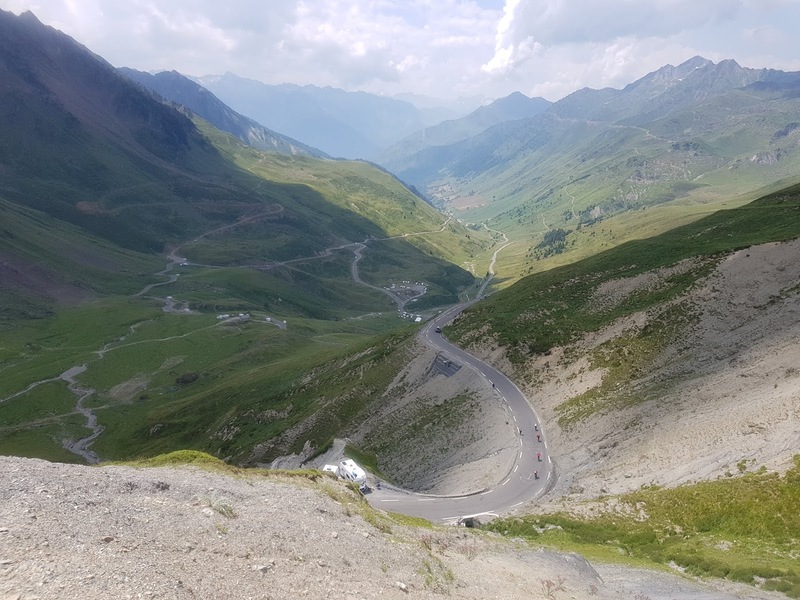 Good to crack the Tourmalet, after missing it in 2013.